Letters Patent are the open public proclamations of the royal court intended for anyone and everyone to read. In contrast, the Letters Close are the court’s private correspondence, intended only for the individual to whom they are addressed. Like the Letters Patent, Letters Close still include wax seals, but rather than hanging from the letter the wax was used to seal the folded letter closed, in the way we often see in period dramas. 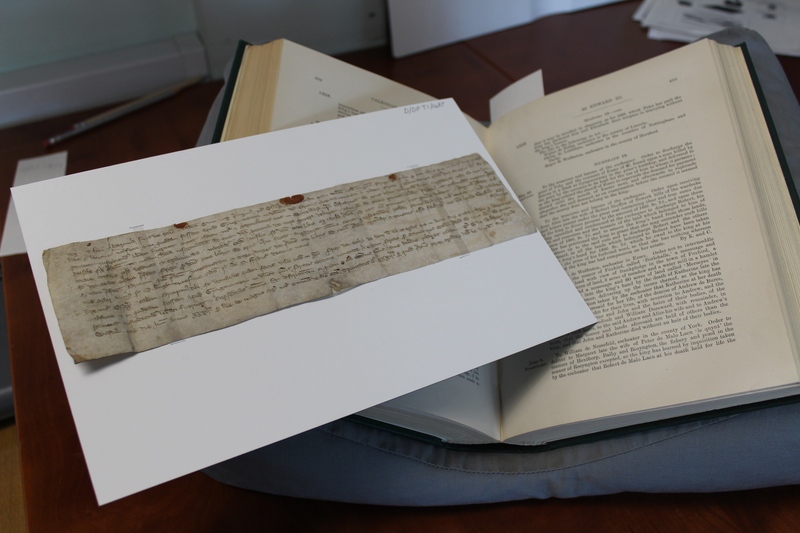 They deal with the more day-to-day activities of the court and as such the original Letters as sent out to the individual are extremely rare and often difficult to identify in collections. As the seal had to be broken in order to read the Letters, the seals are even rarer and at the moment only one known example exists of an unopened Letters Close, dating from the reign of Henry VIII. Like the Letters Patent, they were recorded on rolls which are now stored at the National Archives in Kew. The first Close Roll begins in the year 1204, although there had been Letters Close before that date. The entries from the Close Rolls are also calendared (transcribed and/or translated from Latin, and indexed) in the Public Record Office (PRO) calendars, which are invaluable for researchers. Our collection of calendars in the Essex Record Office Library runs from 1227 through to 1509 (though the rolls for 1227-1272 are only recorded in the original Latin). Following an extensive search through the catalogue of documents held at the Essex Record Office (Indiana Jones style hats were optional for those involved in the quest), we eventually identified what may well be the only original Letters Close in the archive, D/DP T1/1487. This may be the only original Letter Close in the ERO’s collections (D/DP T1/1487). It is shown with its entry in the Close Rolls. You can see the remnants of sealing wax along the top of the Letter. D/DP T1/1487 contains two mandates (or instructions) from the King with two separate dates, one from the 30th of May and the other from the 2nd of June 1358. They are addressed to two different people, the Sheriff of Essex and the Barons of the exchequer. Presumably the barons are effectively being copied into the message to the Sheriff as it impacts them too. The instructions relate to a rather intriguing case. It appears that a dead man was discovered in a ditch on the Priory of Thoby’s demesne land in Mountnessing. He had apparently been killed by robbers. Eight pounds was discovered on his person, which was delivered to the Prior of Thoby to be held “to the use of” whoever it belonged to (what we would call “holding in trust” today). The rightful owner of the money, however, could not be identified nor could the King claim ownership, so the mandate orders that Prior is discharged from his duty and was presumably allowed to keep the money. Unusually the mandates use the same text as a previous entry accidentally sent to the Sheriff of Kent earlier that year, so presumably the letter we have is the second attempt to send it to the right Sheriff. This entry was posted in Archives, Collections, Essex history, Local history and tagged medieval by admin. Bookmark the permalink.